Wine Country Theatre's production of Next To Normal shows at the Park Ballroom in Paso Robles through Dec. 2. Tickets are $25 for general admission, $20 for groups of eight or more, and $15 for students. Visit winecountrytheatre.com for tickets and more information. Being normal is a lofty goal for anyone. But what does it look like when normal is the furthest thing from reality? Wine Country Theatre's adaptation of the American rock musical Next to Normal gets to the heart of a family living with a mother navigating bipolar disorder, and all of its rippling effects. 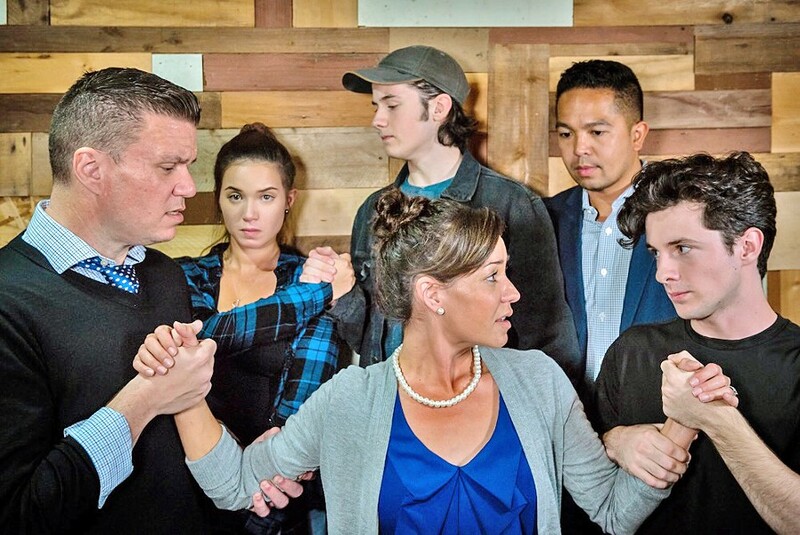 WE STILL GO ON As Diana (Veronica Suber, center) grapples with bipolar disorder, everyone in her life—her husband, Dan (Gary Borjan); daughter Natalie (Julia Seibert) and her boyfriend, Henry (Phineas Peters); therapist Dr. Madden (Ritchie Bermudez); and the memory of her deceased son, Gabe (Elliot Peters)—navigates the illness in their own way. At the helm is director Gregg Wolff, seen on stage recently in the San Luis Obispo Repertory Theatre's production of Lost in Yonkers, leading a local cast that includes Veronica Suber as Diana, the mother with bipolar disorder; Gary Borjan as Dan, her loyal husband; Elliot Peters as Gabe, the son she lost long ago; Julia Seibert as Natalie, her studious but often neglected daughter; Phineas Peters as Henry, Natalie's boyfriend; and Ritchie Bermudez who plays two therapists, Dr. Fine and Dr. Madden. WHO'S CRAZY? Diana (Veronica Surber, right) is haunted by memories of the son she lost, Gabe (Elliot Peters, above), and tries to get better with the help of her therapist, Dr. Madden (Ritchie Berudez). The set is spartan, with just the outline of a house with multiple stories. Bright red, blue, and purple lights permeate through depending on the mood of the scene, which is appropriately all over the place. It takes a while into the first scene to really see that something is amiss. At first glance, Diana, Gabe, Natalie, and Dan seem like your average, somewhat disconnected family. Diana is the housewife bored with her husband and life. Gabe is the delinquent son, always coming home late. Dan is the bewildered husband, and Natalie is the misunderstood genius daughter. But the breadcrumbs are there. Brian Yorkey and Tom Kitt's 2008 rock musical didn't win a handful of Tony Awards and a Pulitzer Prize for drama for nothing, after all. Indeed, the signs are apparent: No one but Diana talks or interacts with Gabe; Diana makes a strangely inappropriate comment to her daughter, Natalie; and then when Diana tries to make sandwiches but drops bread all over the living room floor, the cracks really show. After a trip to Dr. Fine we learn that (spoiler alert) Gabe has been dead for years, and that the traumatic incident brought out the symptoms that led to Diana's bipolar disorder and a never-ending quest to find the right medication. COPING Tired of being the "invisible girl," Natalie (Julia Seibert) raids her mom's medicine cabinet while the spirit of her brother, Gabe (Elliot Peters), looks on. Just like the highs and lows of manic and depressive episodes, Next to Normal feels like a heightened, extreme version of a musical, with scant dialogue connecting one song to the next. Arts Writer Ryah Cooley is taking deep breaths at rcooley@newtimesslo.com.